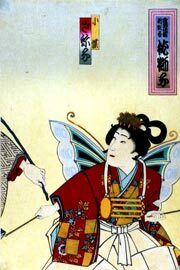 The Nagauta-based dance "Shunkyô Kagami Jishi" was premiered in March 1893 at the Kabukiza. 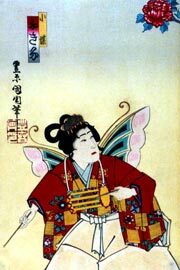 The leading role was played by the star Ichikawa Danjûrô IX and the two butterflies were performed by his daughters Fukiko and Sayako. "Kagami Jishi" is a fantasy whose story is related through the movements of the dancers. 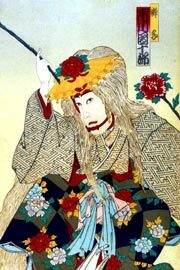 Yayoi, a young lady in waiting in the Shôgun's palace at Edo, was chosen to perform the lion dance at the New Year celebrations, a ceremonial performance originally designed to exorcize evil spirits. The dancer held a wooden lion head with moveable jaws which was decorated with a flowing silk streamer. Yayoi was shy and hesitant, so she was locked into a room with the mask and told to practice. At first she was overwhelmed by her surroundings and danced rather timidly. As she became more engrossed in the task her steps quickened. Fascinated against her will, she took up the lion head and danced a tentative movement. Gradually the spirit of the lion entered into her and took complete charge of her limbs. Two butterflies appeared and the lion head pursued them. Finally the dancing maiden disappeared altogether, leaving only the rampaging spirit of a lion, who then rushed into his lair and back again to sport among the peonies, where he finally fell asleep. Two butterflies appeared to tease him, and he tried angrily to catch them. Finally he worked himself into a mighty rage and stood shaking his great mane around in a fury of movement.